Loss of power isn't that noticeable. I can tell the difference braking though. But only for the first few miles and then my brain just recalibrated and it now feels normal. After a week and a couple hundred miles on my 255/85/16 ST MAXXs I agree with this.....no noticeable loss of power for acceleration (keep in mind I've got a 6MT) but there is a noticeable loss in breaking power.....takes more push on the pedal to slow the truck. Not a deal breaker, but noticeable. Makes sense, these tires are 15# heavier than my last set. 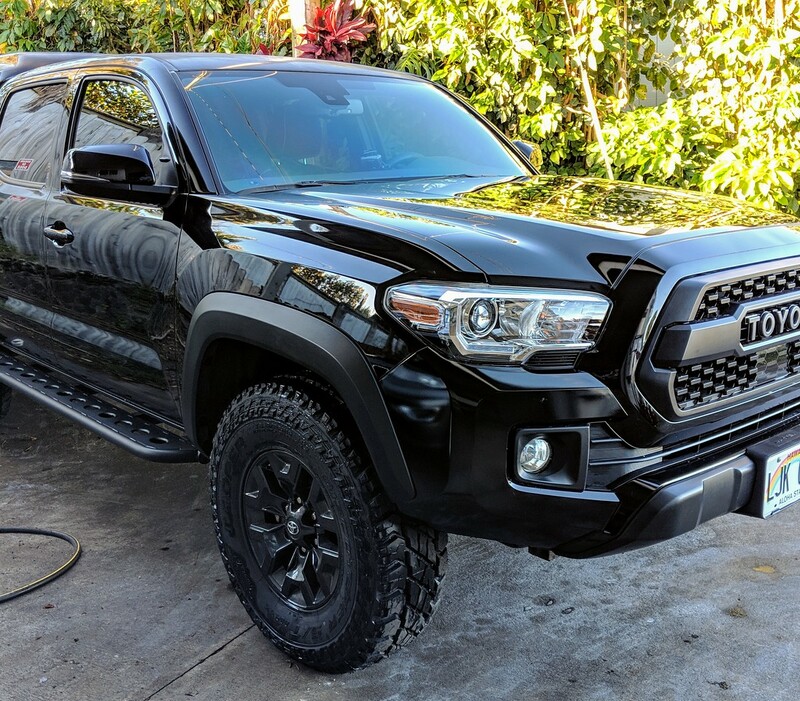 2016trdtacoma and lowtiderides like this. I really want to go this route, what are you guys paying per tire and mounting if mail order? I’m leaning towards the bfg KM3 and on tire rack they’re $242 each. My ST Maxx's were $204 each on Amazon back in January. I then paid $130 to mount and balance all 5 tires. It’s been a long time since I bought tires, my last ones where bfg 33x10.5x15 at $150. I got the Mastercraft Courser CXT on Amazon for $167 per tire. Paid $18 per tire for mount/balance/disposal. helix66 and DillonBarron like this. That seems awfully cheap to mount & balance. I would have thought places would gouge you to m/b tires they didn’t sell. IL, West of Chicago 2hrs. 3 places near me quoted 16, 20, and 24 per corner for mount, balance, disposal. I hate the way my taco looks with the stock tires....might have to do this sooner than later! I can confirm 255/80/17 st maxx on 4 runner pro wheels rubs on the bottom of the fender flare on stock suspension TRDOR, nothing terrible, little Dremel time fixed it right up. Haven't hit cab mount and have cycled suspension well. Got S/T Maxx LT255/85r16s in the mail & installed yesterday. Stock suspension/rims. 71tattooguy, paleh0rse, doublethebass and 1 other person like this. But curious why the st Maxx is so popular. Could it be because the km3 were not available in this size till recently? They combine cheap with a known name. Nobody runs Mastercraft Coursers because they've never heard of them, but Cooper is a well known name. doublethebass and rdpoe like this. Looks great,I have 255/80/17 on my 2015,no problems. Beautiful set up. Your rails are what kind and where did you get them? So nice!!! Great looking truck. Can you post a straight on shot of look of tires?